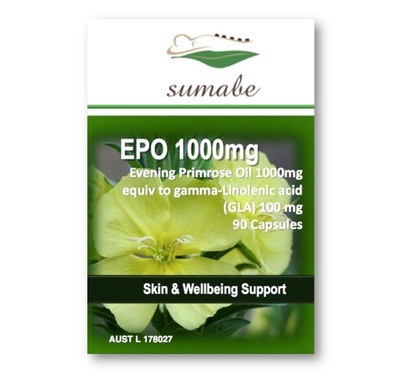 Sumabe® Evening Primrose Oil is a valuable source of the omega 6 fatty acid gamma-Linolenic acid (GLA). EPO 1000mg can assist in the relief of pre-menstrual syndrome, including symptoms such as breast tenderness. By supporting the healing and repair of the skin and assisting to relieve flaking, scaling and itching of the skin, EPO 1000mg can be used for the management and symptomatic relief of eczema and dermatitis. GLA is also used in the temporary relief of pain and joint stiffness associated with arthritis and rheumatism. Supplementation with EPO 1000mg can help to maintain a healthy cardiovascular system and improve general well-being. Adults, take 1-2 capsules three times daily, with meals, or as directed by your healthcare professional. For the management and symptomatic relief of arthritis, take 2 capsules 3 times daily. 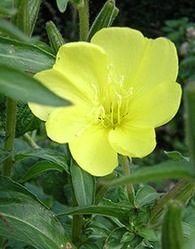 Evening Primrose oil is a valuable source of the omega 6 fatty acid gamma-Linolenic acid. Supports the healing and repair of the skin. May assist in the relief of flaking, scaling and itching of the skin. For the symptomatic relief of eczema. For the symptomatic relief of dermatitis. May assist in the management of eczema. May assist in the management of dermatitis. Relief of premenstrual breast pain. For the symptomatic relief of pre-menstrual syndrome. May assist in the management of pre-menstrual syndrome. Aids in the temporary relief of the pain of arthritis OR Temporary relief of arthritic pain. May assist in the management of rheumatism. Temporary relief of rheumatism OR Temporary relief of rheumatic pain. May help increase joint mobility associated with arthritis. Assists in the maintenance of a healthy cardiovascular system.